I hadn't planned on writing another blog post so soon, but it seems another public service announcement is in order. 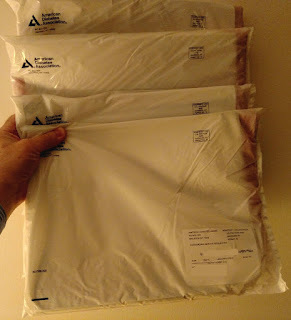 A few weeks back, I was going through my mail. It was full of letters from various charities, each asking for a donation. This isn't unusual. I get about a dozen requests per week. Most get recycled. One of them, however, was from the American Diabetes Association. What caught my eye were the mailing labels they sent. A lot of charities give mailing labels as a bribe an incentive to donate. If I kept all the mailing labels I get from charities I'd need to rent a warehouse to store them. These were different. 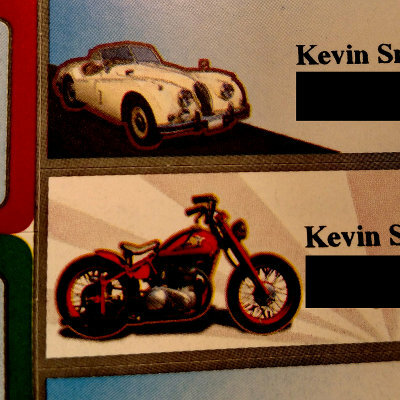 They had classic motorcycles and cars on them. I'm old enough that I'd actually driven and ridden on some of those machines. They are the best mailing labels I've ever received. I was hooked. I had to give them a donation. I was doing my civic duty and all that crap. In addition, another writer I know, Beth Rhodes, is a diabetic, so helping her, albeit indirectly, was a plus. As an added bonus, if you donated a certain amount you'd get a free tote bag. Now, I need another tote bag like I need more mailing labels, but it was part of the deal and I planned on accepting it graciously. So, I sent in my check. A couple of weeks later I found a tote bag wedged into my mailbox. It's an OK tote bag. It, you know, holds stuff. So far, so good. Today, I found out differently. After coming home and parking the car, I went to the mailbox. I could see it wasn't closed. There was a package sticking out. I removed the item. What did I find but another tote bag. Great. I didn't need one; now I have two. I went back for the rest of my mail. And found another tote bag. I had so many bags I needed a bag to hold them. Sadly, this was not a problem. I don't know how the mail person got them all in there. The mail I wanted was in the mailbox, too. Looked like the dog had chewed on it—and I don't have a dog. Standing at the mailbox, I pondered the significance of this event. 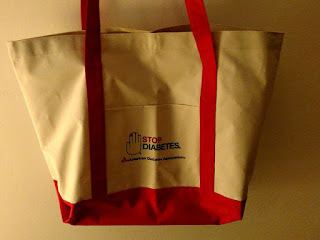 Had the ADA sent out five tote bags to everyone who had donated? Was the USPS about to succumb to a burden they couldn't possibly handle? Did I get someone else's tote bag? Or, should I say, four other people's tote bags? Would the ADA go bankrupt from the postage fees? What should I do? I'm not even sure if my donation is tax-deductible now since the value of the bags is probably more than what I sent. It says they're a non-profit organization. If they weren't before, they are now. Someone at the ADA had made a terrible mistake and it was all my fault because I had given a donation. I felt so guilty about what I'd done I went to the ADA website and made another donation. I figure the way they're handing out tote bags they'll need it. And if you haven't donated to the ADA yet, you might want to—before it's too late—for them. Just make sure you say "no" to the tote bag. You don't get those mailing labels? Please tell me your secret! I don't know how many charities send me those things. There are times when I have a stack of 10 (or more) sheets to cut up and destroy. I keep a few that I like. You can't run them through the shredder as it gums up the cutter blades. I don't send that many letters anymore! The worst is the March of Dimes - they have my address wrong - and yet their donation request still finds its way into my mailbox! Oh my gosh! I used to get address labels and note paper 'till they overflowed my desk drawers. I mean, I write a lot, but not quite THAT much. It became a source of guilt that the tiny donation I made years ago was long used up by the cost of these 'gifts' I kept finding in the mailbox. Then I moved, and moved again, and moved once more, and somehow they have not been able to keep up with me. It's possible the people now living in that house are getting right-address-wrong-name labels every three weeks in the mail, and that's quite alright by me. You're quite welcome! At least I have these bags to hold all my mailing labels!